I mention specifically that Mr. Anfang's mother died 14 days before the championship and therefore he was not quite ready for the load, which was taken advantage of by the WMRA people incl. Mr. Münzel. 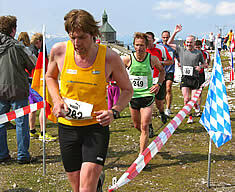 Mr. Anfang, organizer of the Hochfell Mountain Run, Germany's oldest mountain run, had presented an organisation plan for the finish area a few weeks before the championships and there was no contradiction. During the team meeting not one word was „wasted“ about it, Mr. Anfang assures, because he was present right to the end of the meeting. Then the welcome dinner at the tent: the WMRA gentlemen were all absent although the organisation team of the Hochfelln Berglauf had made every effort to present an attractive program (music, folklore etc). The reserved tables were empty and the gentlemen instead met in some hotel to organise the „campaign plan“ to move the finish line. WMRA president, went up to the summit about 8 o'clock and ordered the judges to move the finish line down. Kozzelino insisted on red spray to mark the new finish line. After the start, Mr. Anfang took the cable car up and saw this „impudence, insolence“ by Bruno Kozzelino. Mr. Anfang got terribly excited about this insidiousness. Bibi Anfang himself took a shovel to remove the red markings and ordered his judges to restore the original finish line. About 2,000 spectators were witness to this incident. In face of Mr. Anfang's rage, Kozzelino did the only right thing and disappeared. These methods of the WMRA and Mr. Münzel and Mr. Raatz are not unique, but the rule. In 2005, there is only one single race in „44 Austrian mountain races“ that includesa downhill part. In Switzerland, the situation is similar: there is only one in „62 mountain races in Helvetia“ that has a downhill part worth menitoning. The same is true for French and Italian mountain races. In Italy, there are a few more races with downhill parts, but none of them are start/finsh mountain races. Those few existing Ultra mountain races are not included, but after all, they don’t host mountain running championships. 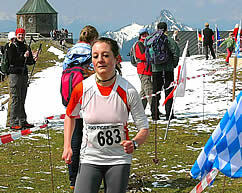 In thirty German more or less so called „mountain races“, there is not a single one leading up- and downhill. There will be one exception this year though: the national championships in Unterharmersbach which do not fulfill the criteria in the first place. Mr. Münzel, the German mountain running official, and the German Athletic Association (DLV) want to introduce downhill running championships in Germany and the entire Alps. This goes regardless of category – be it local, masters, or juniors. For these reasons, we intend to establish a new World Mountain Running Associaton which will each year host uphill championships. This association is also supposed to host European and German championships. 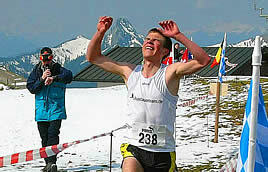 Therefore, 99 % of the Eurupean mountain running organizers are able to apply for championships. Worldwide, this will be happily supported as well. I would be glad to receive your opinions on this matter. 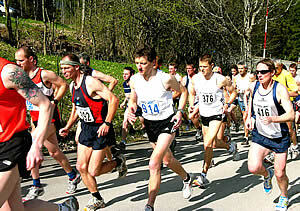 The World Mountain Running Championship 2005 takes place on Sept.25 in New Zealand, near Wellington. 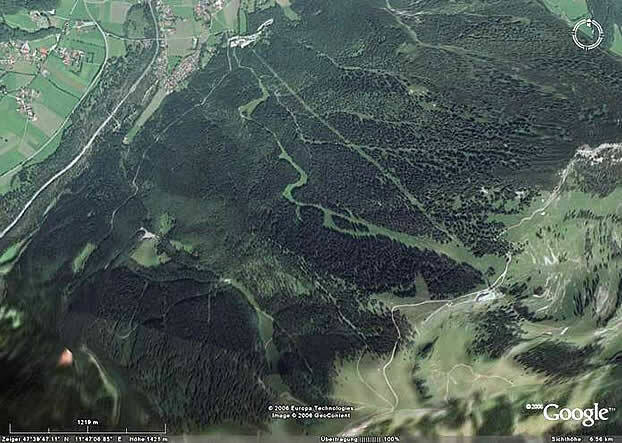 That is funny hill running: 6 times 100 to 200 meters up and down. 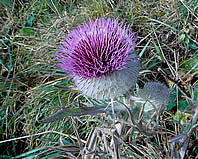 The Master World Championship 2005 is in Keswick, England at Sept 10. The separation between both is of course nonsense, since the previous solution could be commercialized considerably better and in addition increases the attractivity for the respective host country respectively the local area. Today, it is more lucrative to organize Masters Championships because many more participants and their families with more money spend more time there as the younger age-groups. The New-Zealand Association has even sponsored $ 120 000 to the other country associations so that as many athletes travel to that far country as possible. It is not cheap, which young athlete can pay for that? The run in New Zealand is regular uphill/downhill! In Keswick, the masters championship has corresponded simply to the wish and the influence of the president of the WMRA. O.K. so far so bad! But to select a total up-and-down-course in England for the seniors is an impertinence to older sportsmen. It is also complete nonsense to split the competition in 2 different courses according to age, 9.5 km with 476 meters up and down and 11.6 km with 684 meters up and down. If this hilly country Lake District has to be selected for a mountain running world championship, I ask Danny Hughes then not to approve any health damaging downhill course. 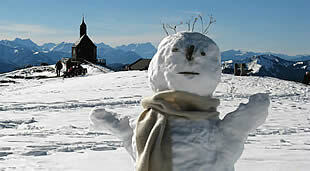 If the planned course is not changed we MOUNTAIN RUNNERS of the alpine countries will not participate in that. 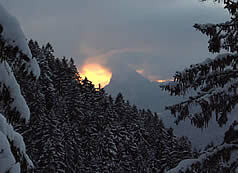 We would go, however, with pleasure just as numerously to England as English runners came into the Alpine region. Due to the great confusion that has been existing about what makes up mountain running, and the criteria that should be the basis of the different types of events, it is about time to agree upon a reliable set of rules. These should be binding for the currently capable organizers as well as for those who plan to join in in the future. The main focus of this matter should not lie on what associations or managers have in mind, but what MOUNTAIN RUNNERS require and have approved of by their participation in the already existing, attractive mountain races. How do we clearly distinguish mountain running from road or cross country races? The difference needs to be made clear in order for mountain runners to be able to run up a mountain and road runners to run on the roads. Even cross country racing to its greatest extent does not have anything in common with mountain running. 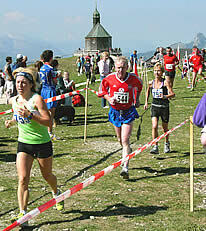 Since the DLV is not able to organize its own mountain races, it depends on the already existing events. Neither the people in charge of running nor the managers have either the potential or the ability to do so. Furthermore, they are lacking both financial and organizational resources. Concerning national and international championships, we are of the opinion that visibly attractive mountain races can only take place in the mountains. The same should be true for any other cup races or races of any importance whatsoever. MOUNTAINS are no HILLS. 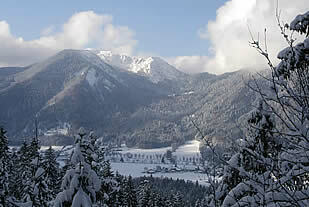 Places lacking mountain ranges may of course host regional HILL RACES. This does not permit them to carry the MOUNTAIN RUNNING SEAL OF QUALITY though. Defining MOUNTAIN RANGE: clearly distinguishable elevations of the earth’s surface with strongly alternating mountains and valleys. 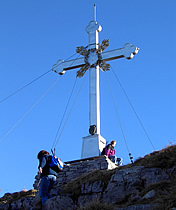 You won’t find any summits among hilly landscapes (or have you ever come across a cross on a summit in the Taunus?) because there are no clearly distinguishable elevations there. Therefore, national and international mountain running championships can only take place in the regions described above. The altitude of the starting point is not of any importance. Theoretically speaking, you could even start from mean sea level on islands or the sea alps if these places show obvious signs of mountains. For international championships, an existing infrastructure is required. This does not necessarily include the existence of a mountain railway near the finish line. Infrastructural elements should be provided near the starting point though. These include sufficient parking space, restrooms, accommodation, etc. The transportation of changing gear to the finish also needs to be taken care of. Food and drink supply during the race is not necessary. All of this concerns championships respectively international cup races. The display of the final results 2 hours after the last runner has finished the race is absolutely necessary. Adequate space for the awarding ceremony should be provided for, depending on the number of participants. We expect organizers at this level to present a web site as well as the usual application form which should be ready to order or view in the internet at least 3 months prior to the race. The application form should include information about the course profile, altitude (on a scale divided up into at least 100 Hm ), and distance as well as a description of the course. 1. The course profile is of prior importance. 3. No more than 20% of the total distance may be paved. 4. The total distance should amount to no less than 6 km and no more than 21 km. 5. Depending on the total distance, there are to be no more than 50-150 Hm area related downhill sections on the course. The longer the total distance, the more downhill sections may occur, preferably mountain paths or trails. 6. Summit races are to be ranked higher. 8. Minimum altitudes of 1000 Hm for Grand Prix and International Cup races and National Championships. 9. The percentage of mountain trails is of great importance. 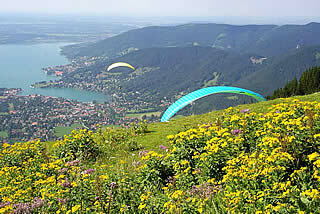 This means that the altitude and the distance may vary if the share of mountain trails significantly exceeds 50 %. Accordingly, if the total altitude significantly exceeds a total of 1200 Hm respectively 1000 Hm, the share of paved roads may add up to more than 20 %, in no case may it be more than 30 % though as this would put the real character of a mountain race in question. 10. These criteria are also valid for women and all age groups. Reason: The fact that the participants are women or seniors does not justify a shortage of the course. Accordingly, Marathon Masters World Championships do not provide a distance of 30 km, but of the usual 42,195 km. The defined age groups should end at 75 years. It is a fact that seniors and women are usually slower runners at every event. Not a single distance is being shortened for them. 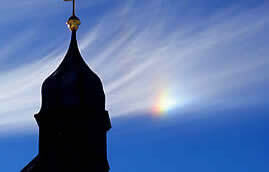 It goes without saying that a special mountain region is being chosen. This means the level of popularity in its country and the level of performance of former participants. 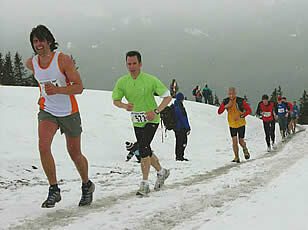 In addition to this, the number of participants give proof of a certain level and attraction for mountain runners. The International and National Masters Championships should be held on the same date as the regular Championships. They should not be separated in time and space and preferably even be held on the same course. As a consequence, the level of attraction would rise as well as the awareness among press, radio broadcasting and television. Furthermore, this would mean an additional saving of costs. Der Wallberg aus der Vogelperspektive. Die gerade Auslichtung ist die Seilbahn, links davon die Skiabfahrt, unsere Laufstrecke für die 1. Europa-Meisterschaft im Extrem-Berglauf. Oben, der weiße Fleck ist die Talstation, der Start.